Patients at the Tribhuvan University Teaching Hospital, Kathmandu, Nepal, are taken outside following the second earthquake on 12 May 2015. The emergency preparedness efforts implemented by the Government of Nepal over the past 15 years have ensured that key elements of the health sector remained ready and able to function during the recent earthquake that devastated large swathes of the mountainous country, the United Nations World Health Organization (WHO) said today. According to WHO, the practice of hospital retrofitting – a process which involves everything from repairing cracks in walls to installing seismic belts and roof bracing – has been a core part of Nepal’s preparedness plans and helped keep the largest hospitals in the capital city of Kathmandu working throughout the 7.8 magnitude earthquake which struck on 25 April and the 7.3 earthquake which rattled the country on just yesterday. WHO has also been critical in assisting Nepal’s Ministry of Health and Population during their implementation of emergency preparedness efforts. In 2009, for instance, it focused global attention on the need for safe facilities in emergencies through its World Health Day campaign which underscored the need for building strong health systems able to provide medical care in times of disaster and emergency. The UN agency has continued to promote this aim with direct technical and material support. However, retrofitting alone is not sufficient for an adequate healthcare response in times of disaster, the WHO has warned. Capacity building and staff training is equally important. Dr. Pradeep Vaidya, coordinator for the WHO-supported Hospital Preparedness for Emergency Programme, has noted that the response to the earthquake by Nepal’s health care providers was resilient because of pre-planning and training initiatives. In Nepal, the WHO has been placing particular attention on training in triage management, putting into practice its guidelines and strategies in mass casualty systems. Due to the training, the agency said, emergency responders could quickly prioritize the injuries and save lives when large numbers of patients began to arrive in the hospitals following the recent earthquakes. 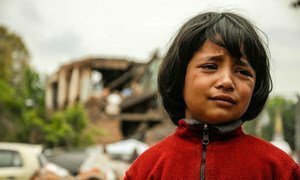 A new earthquake measuring 7.3 in magnitude has struck Nepal today killing at least 40 people, according to information received by the United Nations, just two weeks after a powerful tremor killed more than 8,000 thousand people and devastated much of the country’s infrastructure.